Nope, that is not a starbucks employee sneaking away coffee!! Great! If not, scroll back up and come back down! Any exercise is good! So, here I was quaintly sitting and sipping my usual coffee at Starbucks, when a guy in a green apron walked up to me and asked me if I'd like to participate in a coffee tasting! Why would I say no? I kept my book down and waited for a few minutes, but the guy disappeared! After a couple of minutes, I went back to reading my book. He reappeared after about 10 minutes with a tray in hand! My eyes went to the cookie, but that is a different story! Seating himself in front of me and with the outlets Coffee Master accompanying him, I thought I would amuse myself. How wrong I was! These guys taught me much more than what I knew of coffee and if you participate, so will you. He was also quick to say that since I keep ordering the cold coffees with milk and essences and whipped creams and flavours, none of what he says will make a difference, but if you graduate to plain coffee, there is a whole world out there! As with most tastings, he spoke about Smell, Sip and Feel, but added a fourth dimension to tasting that I wasn't aware of with other things like Tea, Chocolate or wine tastings. DESCRIBE. "Sir, you must be able to clearly describe the coffee, else you won't be able to communicate," he said. What I liked was for the first 90% of his demo, he said nothing about Starbucks! It was all about coffee. Let me add a few things that I was able to discuss with them! Why do baristas push for bold dark roasted coffees? Apparently those who like bold flavours and full bodied coffees like the dark roast! French and Italian roasted coffees are dark roasted coffees which no doubt have that full bodied flavours, but the origin flavours are completely gone and are replaced by the roasting! I'm more of a light roast guy! I'd prefer to be able to taste the origin in coffee that just the roasting! And that is why coffee is so personal for people. A few years back, when I saw people asking for a Dark Roast, full bodied, low acidity double espresso, I thought they were being picky. Or snobby! Far from it. Dark roast coffee is easier on the stomach as the acidity is muted while the light roast ones retains acidity! But then, theory apart, the coffees masters spoke about the sipping techniques, the feeling of flavours and then describing. The best part was the pairing. I have no idea about coffee pairing! Those guys said that pairing is to make sure the best of both are showcased and so for a medium roast coffee, a medium sweet cookie goes best as they apparently accentuate each other. The best way is to experience it yourself! 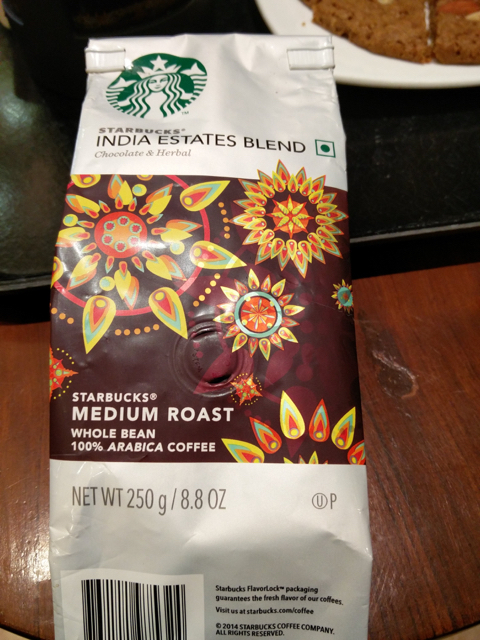 Coffee tastings happen in all Starbucks around the world when it is not too busy! And we thought coffee decisions were limited to Small, Medium or Large!